Mobilising Armies is a safe Members only Activity that requires you to be a leader of an army. You, yourself do no fighting, but instead command ten squads in order to defeat three other teams. To achieve victory, you must have the most determination, the most patience and the best strategy. Mobilising Armies is located in the south-western part of the Feldip Hills and west of Oo'glog. There are many methods of travel to get there. 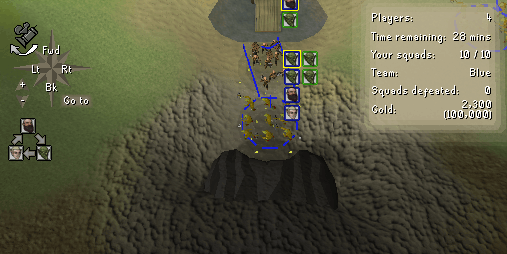 The Mobilising Armies Teleport requires one Water Rune, one Law Rune, one Air Rune, and level 10 Magic. You will be teleported right outside of the Activity's gate. The Ring of Duelling Teleport has no requirements. 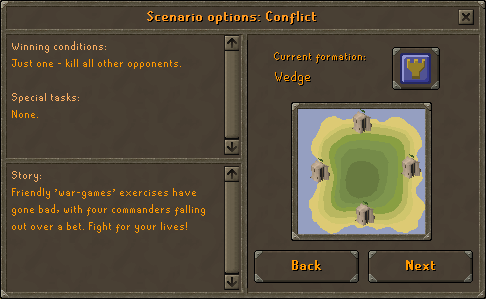 Just click teleport to Mobilising Armies Command Center, and you will be in the same spot as the Mobilising Armies Teleport. Another teleport is the Spirit Tree Teleport. It requires the completion of Tree Gnome Village to use Spirit Trees, and the completion of The Grand Tree if you wish to use The Grand Tree Spirit Tree. Another method of travel you can take is the Gnome Glider to Feldip Hills (requires One Small Favour and The Grand Tree) and head south. There is also the fairy ring that has the code A-K-S that will take you north of Oo'glog. You can either summon a Spirit Larupia (level 57 Summoning required) or use an Eagle (requires Eagle's Peak and level 28 Hunter) and just head south. Upon entering Mobilising Armies, Junior Cadet Mal will be standing by the entrance. Speak to him. He will tell you that the squads are having trouble. Ask if there is anything you can do. He will say you can help the squads receive the stolen supplies. You will then enter the training field. The first thing that Mal tells you to do in the training field is locate your squads. To operate the camera you can either use the camera operation on the screen, or the arrow keys on your keyboard. Your troops will be just a little to the north-west. Once you spot them click on one of them. Mal will then give you the next set of instructions, which is to make them move. Once you have selected your troops, click the icon that looks like footprints and then click anywhere on the land to have your troops move. Once they move it's time to find the stolen treasure. Mal wants your squad to go explore and locate it. To make them explore, go to the same screen you did to move and click the explore button. Once they locate the treasure, mercenaries will come to attack your squad. To attack the mercenaries back, select one of your squads and click on the attacking squad. The mercenary squad will start defeating you, and you will need to use special units. Click the icon that looks like a target. There should be a glider on the second row that has a green 1 on it. Click it and use it on the mercenary squad. That will finish that squad off. There will be two more squads on the way on the west side of the island. Use the 5 Gnome Gliders to finish them off. Congratulations! You have finished the Tutorial! Since Mobilising Armies is a game in which you command squads, you are nowhere in sight. This means there are different controls and camera angles. The Camera controls your entire screen. 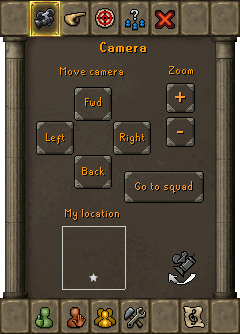 With the arrow keys or the buttons on the Camera icon, you can move the camera forwards, backwards, to the left, or to the right. The zoom buttons allow you to zoom in closer to see the battle or zoom out for an upper view of the battle. The camera angle button allows you to switch the views of the camera that you are watching. 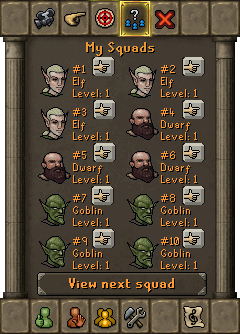 The picture of the dwarf is the picture that tells you which squad you have selected. 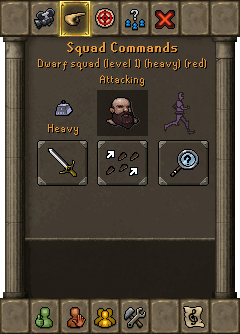 The symbol to the left of the dwarf image of your squad tells you whether your squad is heavy or light. The symbol to the right of the dwarf tells you whether you squad is idle or in movement. The image of the sword is the option to attack other squads. The symbol of footprints is how you select where you want your squad to move. The picture of the magnifying glass is the picture that sends your squad exploring. All of the special units on this page are bought from the table to the east of Mal. Click on the one you'd like to use that has a green number by it and select the squad or area you would like to use it on. You can only buy a maximum of five at a time. The cannon shoots a cannon ball in the direction that you have it set to. The gnome glider inflicts a high amount of damage to the squad you have sent it to attack. The chompa is a bomb that blows up and inflicts damage to the surrounding squads including your own. The distracter distracts all squads from their given task to complete. The barricades blocks all squads, including your own, from anything that the barricade surrounds. This screen allows you to control any of your squads without having to actually find them on the screen. Choose the squad you want and it will show up on the squad commands screen. If one your squads are defeated, that squad will be displayed with an X on it. If you wish to leave the game at any time without finishing, you will need to click this screen. If you forfeit, you will return with no squads and no special unit contract. It is best to leave the game by killing off all of your squads. This way you do not lose them. Mobilising Armies has four different scenarios: Conflict, Siege, Hoard, and Rescue. Each scenario requires you to command ten squads, however there is a different objective in each scenario. 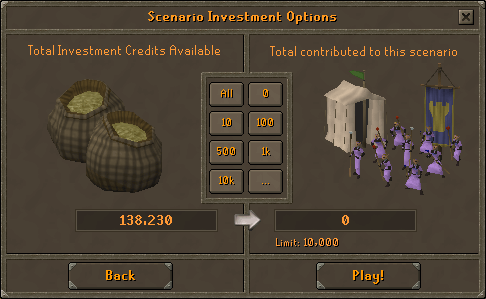 Before you can play, you must cash in items (Commodities) to receive investment credit. To find out what Commodities you can turn in for credit, talk to Mal and he will show you. The more Commodities you turn in, the more investment credit you have and the more you can spend on playing. You must give at least one Commodity to Mal before you can go on. Now that you have your investment credits, go to the tent to the south-west. Inside there will be a dwarf, elf and goblin. Talk to each of them and get three monsters of two different types, and four on the remaining (the maximum number of squads you can have is 10.) If you intend to win, it is preferable to buy them all heavy instead of light. Dwarf Squad Level 1 (Heavy) - Combat Stat: 350, Life Points Stat: 1,010, Discipline Stat: 60, Cost Each: 100. Go show Mal your 10 squads and he'll send you to the tables to the east. Click 'use table' and you will get a screen filled with Special Units. Buy five you like and your Special Unit Contract will update with them. Go talk to Mal and he'll tell you you're ready to start playing! To start a scenario you must go down to the briefing room entrance. Once you click "go down" you will get a message about scenarios. 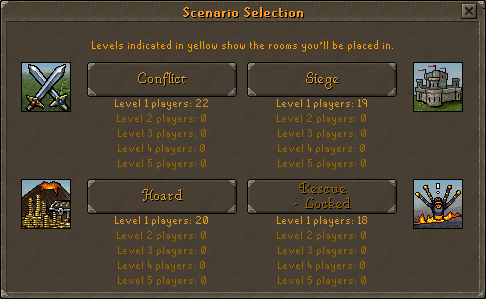 Click the scenario you want to play. 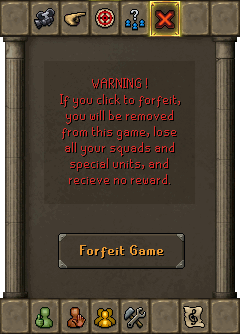 After you have clicked the scenario you wish to play, you will be given a screen about how you want your formation, a quick storyline, and the terms to win. Click the button with the castle wall to switch your squad's formation if you do not like it. 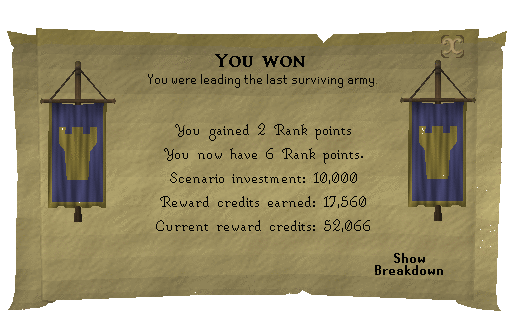 Once you have finished with this screen, click "Next" and you will be asked to contribute investments into the battle. It is not required to submit anything, but you will either gain no reward, or very little. The more you contribute, the more reward credits you will gain at the end of the battle. Once you have submitted all of the investments you want, click "Play!" to enter the waiting room. If any of your squads are defeated during battle in a scenario, you must either recharge them or destroy them and buy new ones.The cheapest way is to recharge them. To recharge them, go back to the tent where you originally bought them and choose "Manage" by right clicking on the Dwarf, Goblin, or Elf. You will now have a screen that tells you all about each of your 10 squads. Click the bottom button that says re-supply all. It will ask you if are you are sure, and click re-supply all again. 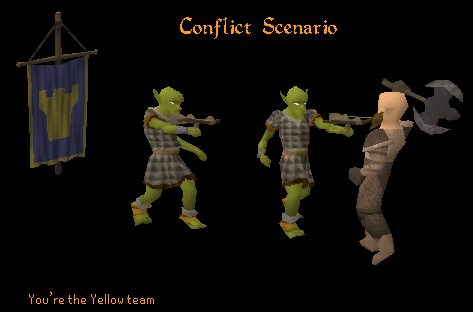 Conflict is a scenario that is a free-for-all type game where the last squad standing is the winner. Once you have been chosen from the waiting room, you will be given a screen reminding you of the scenario and what your team color is. Once you enter the battlefield you will be on, there will be three other teams. In order to win, all of the other teams' squads must be defeated and you must have at least one left standing within 30 minutes. You will have a box in the right hand corner of your screen that tells you all the information about what is going on for the game. The thing to remember is Dwarves are stronger than Goblins, Goblins are stronger than Elves, and Elves are stronger than Dwarves. There will be a little icon on the left side of the screen to remind you. You can attack the squads by either sending squads to attack them or by using some of your five purchased special units. You can also make your squads explore to find food to heal themselves. Once you have defeated a squad, the box in the right hand corner of your screen will go up and the Mobilising Armies' chat box will tell you. The more squads you kill, the higher up your reward credit will go when the battle is over. If by any chance all of your squads are killed before the end of the battle, you will be sent to the briefing room with your reward credits and plus one rank. If you are the last commander standing with at least one squad undefeated, and all the other teams defeated, you will be the winner. If you win, you will get your reward credit plus more, and plus two in rank. If 30 minutes go by and there are still other teams standing, it will be considered a tie, and all teams will be sent to the briefing room with their reward credit and only gain one rank. 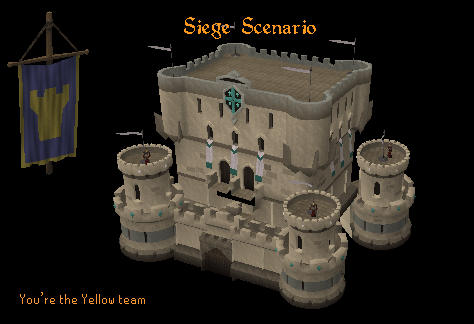 Siege is another scenario where you must battle against three other teams. In Siege there is a castle in the middle of the field. To win you must break down your side of the castle before the other teams can break down theirs. The other option to win is to be like Conflict, where you must be the last remaining team in play. Once you have entered the scenario you will have a box in the right hand corner of the screen again, but this one will tell you what items you need to collect. You need to collect the certain items so that you can build a catapult to fire at the castle wall facing your side. It is not necessary to build a catapult, but there are turrets on the wall that will attack your squads if you send them to attack the wall for you. The turrets will most likely destroy all of your squads before they are able to tear down the wall. You have all of the same moves as you do in Conflict, but you also have an additional move that allows you to destroy the castle walls with your squads. The non-highlighted items are those of which you need to collect at least one of. They are: Metal, Rope, Wheels, and Wood. The items are collected from wrecked ships along the corners of the sea shore. Once you have sent your squad to receive those items they will automatically put the catapult together. After the catapult is built, it will need four rocks to fire. Rocks are found near all team bases. The catapult being fired once will do about as much damage as your squads would do, however by using your catapult your squads will not be harmed by the turrets. Your squads will need to keep collecting rocks in order to keep the catapult firing. So that your team has a successful chance at winning, you also have the option to attack other teams' catapults. To attack their catapults, you must click on one of your squads and send them to destroy a catapult by clicking on another teams'. If you would prefer not to destroy the wall, you can win the same way as Conflict and be the last squad standing. If you are the first squad to completely tear down your side of the castle's wall, you will win. You will be sent to the briefing room with your reward credits, and an additional two ranks. If another team tears down their castle wall first or defeats your squad, then you will be sent to the briefing room with your rewards and only gain one rank. Hoard is scenario where you and three other teams race to get the most coins. Hoard has a volcano in the middle of the field that has entrances throughout the entire edge of the volcano. The entrances have gold pieces within them. You must send at least two squads to an entrance and have them start unloading the gold pieces. To win you must be the first one to get 100,000 gold pieces. Also, as in any other scenario, you can also win by having the last standing squad. To unlock hoard you must have played Siege, and Conflict at least one time. 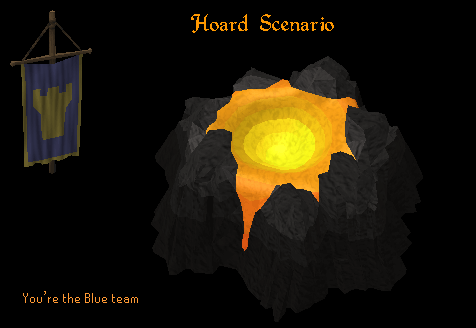 To gain gold from the dragon hoard you must have at least two squads at the cave. They will start unloading the gold and your money count will go up. The caves will eventually run out of gold temporarily, so it recommended to have squads at different caves. Once a team has reached 100,000 gold pieces they will be the winner, and returned to the briefing room with reward and gain two ranks. If you are defeated or are not the first to collect 100,000 gold pieces you will lose and return to the briefing room with you reward and plus one rank. 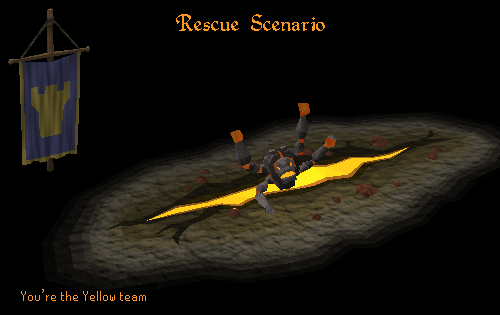 Rescue is a scenario where you must be the first to rescue 28 TzHaar from the fire shooting from the cracks on the island. The other three teams will race you in saving the TzHaar before you do. To unlock the Rescue scenario you must have at least attempted Conflict, Siege, and Hoard. On the center of the island there are fiery cracks scattered around. At various times TzHaar will appear on the cracks, and you must rescue them. 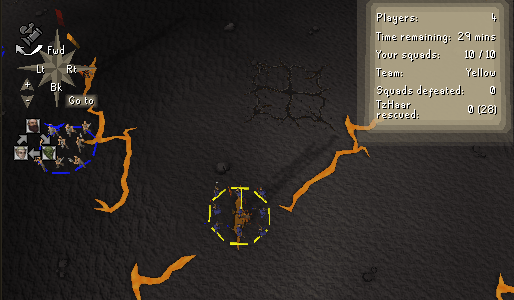 To rescue them select a squad and click the TzHaar in the fiery crack. To get more TzHarr rescued instead of waiting for them to appear, you can steal them from the other teams' boats, or attacking the squad that is taking one to the boat. Once you have collected 28 or defeated all of the other squads you will have won. If you win you'll be returned with your reward, and plus two ranks. 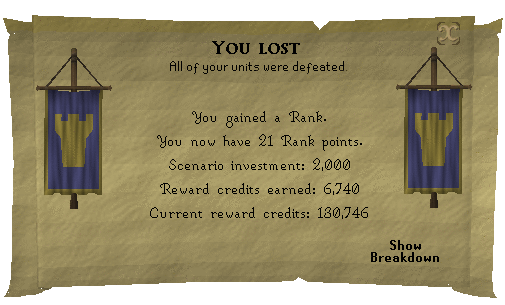 If you are defeated before the game is over or another team has rescued 28 TzHaar before you, you will lose and be returned with your reward, and only plus one rank. Try not to move from your original position. Let the other teams come to you so you have an advantage to attack while the rest of your opponent's squads are still on their way. Save your attacking special units for when a team attacks you and you need them most. Use all of your squads to attack a single enemy squad at one time, as this uses all of your power and defeats your opponents' squads quicker. Get your supplies for the catapult as soon as the game begins. Once your squad builds the catapult, make them go in a circular pattern collecting rocks. Once the wall has some damage to it, send some of your squads to attack the wall, and have some still collecting rocks. Have multiple squads at different caves collecting money. Attack squads to gain gold pieces if your are in need of gold. Collect the TzHaar as soon as you see one spawn. Have some of your squads that are waiting steal some TzHaar from other teams' boats. 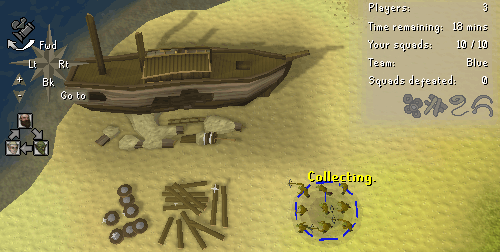 Attack squads that are returning TzHaar to their boats if you are in need of TzHaar. Every time you win or lose a battle you will be returned with reward credit. Reward credit is used to purchase rewards from the Reward Tower located south-east of the Mobilising Armies Command Center. Based on your rank you can go up the Reward Tower, and the rewards get better and better. For people who have 0+ rank you can purchase Serjeant. 100+ Rank you can purchase commander, 200+ Rank you can purchase War-Chief, and 300+ you can purchase Lord Marshal. You can also enchant your rings to have better combat stats, receive spoils, and buy Quest Kits and Locators. The Spoils of War allows you to pick 3 of the 5 items shown for you to buy. The Serjeant clothing has no stats and is worn mostly for looks. Commander also has no stats, and is also worn for looks. 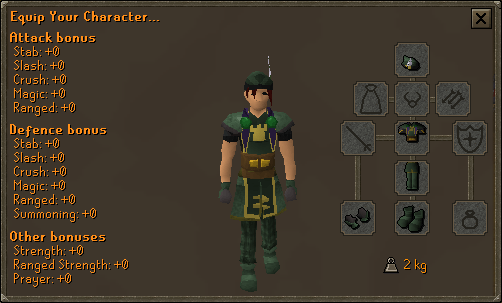 The Lord Marshal, like all outfits, has no stats and is only worn for looks. The Poor Locator locates items such as Silver Ore, Clay, and Maple Logs, and teleports you to their locations. The Good Locator locates items. 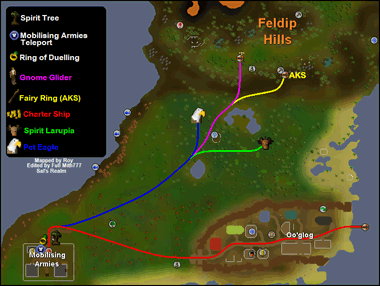 such as Gold Ore, Mithril Ore, Yew Logs, Herblore Secondaries 2 (high level), Fish 2 (Cage/Harpoon spots), and teleports you there. 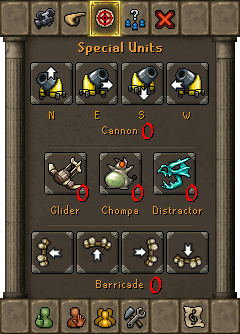 The Superior Locator will locate items such as, Adamant Ore, Runite Ore, Magic Logs, and will teleport you to them. 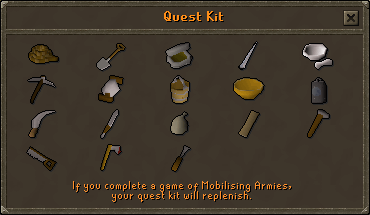 Quest Kits are kits filled with items that are most likely used in quests. 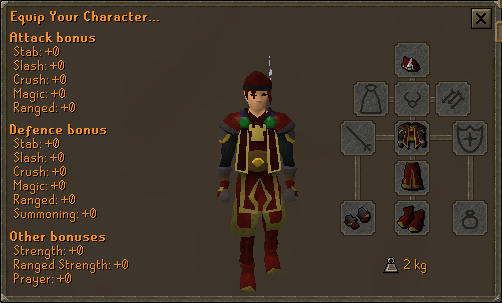 The better the quest kit you buy, the more and better the items become in the kit. 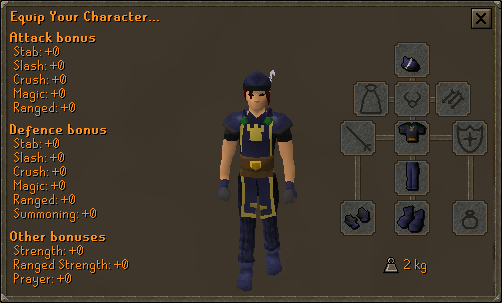 The Quest Kit (Elite) comes with the most items, and the best items mostly used in quests. Instead of buying Locators and outfits, you can pay the shop owners to enchant your rings to give them higher combat stats. Each shop owner can enchant their own range of rings, and the higher up the tower you go the better the ring can get enchanted. The Serjeant can only enchant Gold Rings. The Commander can enchant Sapphire, Emerald, Ruby, or Diamond Rings for his price. The War-Chief can enchant a Dragonstone Ring, Lunar Ring, and Ring of Charos for a slightly higher price. The Lord Marshal can enchant the best rings for the highest price.